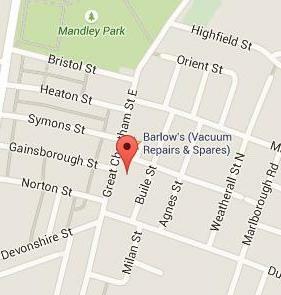 Barlows are situated on the corner of Bower Street. J Barlow's offer Rug Doctor Repairs in the Manchester & North West regions. 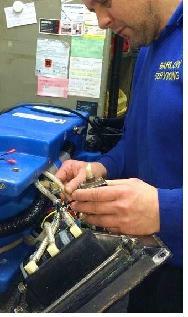 Barlow's have been Servicing and Repairing Vacuum and Carpet cleaners since 1979 can offer a no nonsense economical service for Rug Doctor carpet cleaners, from blocked jets, suction motor overheating or spray pump simply not spraying. We can also offer a fast track service for business or commercial Rug Doctor users who need quick repairs to get their business 'Back in Business'. Barlow′s offers free over the counter estimates for Rug Doctor customers in the North West including regions such as Greater Manchester, Lancashire, Cheshire and West Yorkshire although we can also offer Rug Doctor repairs for customers from other areas via courier service. The benefits in having a Rug Doctor Serviced is that it can help improve the performance of a machine while also helping prevent potential breakdowns and more expensive repairs. Gelu Florea... "Great service - prompt, quick service and a friendly chat and my Rug Doctor is back on track, Barlows will be my first choice in future"
Clive Rubinstein... "Top service, I had my Rug Doctor serviced and repaired at Barlows. The service I received was exceptional, The staff were friendly and John went out of his way to get my cleaner repaired. His knowledge about vacuum cleaners and carpet cleaners was brilliant. Thank you to John and all his staff for my top quality repair. I will certainly recommend your services to friends and family"